Apple’s World Wide Developer Conference took place today and with it came a flood of news articles about what Apple said today. Many of these were off the deep end as if what Apple was saying was music of unearthly quality. We did not attend (and were not invited anyway), but have been reading some of what is being pushed out to the Internet. What we have noticed in the video, articles and live feeds is something that we have talked about time and time again. Apple is not the same company as it was with Steve Jobs. Now before anyone decides to tear my head off I will talk about some of the cool (for Apple owners) features that they announced at WWDC. The first was one that was hotly debated in the weeks leading up to the event; the specs for the new Macbook Pro. We found that many of the rumors were true and you are getting your Retina display (which unless Apple changed something will impact battery life) and a 768GB SSD. Apple is packing all of this into a very thin case and then jacking up the price to $2,199 for the fully packed model (the low end 13-inch will set you back $1,099…). Apple is packing this into a shell that is only 18mm thick. The problem is one of battery life. Even the 11-inch model is only claiming 5 hours which is on par with many of the existing ultrabooks out on the market already (and which are much less expensive). For the iPad/iPhone fans Apple had quite a bit to show you. With the launch of iOS6 you get Google Wallet, Skype/Qik, and more!... Well you really do not get those exact features, but you get a Apple’s version of Wallet called Passbook. To their credit Passbook does more than what Google Wallet is capable of right now, but we would want to see things in action and will also wait until the security people have a once over on it before we get too excited. As for Qik Apple has finally caught up with the times and will allow Face Time over cellular services. This is only about 2 OS generations behind, but if they can wait on Copy and Paste and still sell it, then we do not see why they won’t get away with this. In all there are a claimed 200 improvements in iOS6, but who is counting with features like an improved version of Siri and Apple’s own Map app. We do wonder if it will display everything on the map or only what Apple wants you to see… As we have told you before although Apple bills it was a search engine (and the patent that covers Siri is for a method for Unified Search) it is not, everything you ask gets scrubbed by Apple’s servers and if approved it goes out to their approved search engine list. The Map app is now tied to Siri and Siri can derive answers from that API as well. You can ask where the nearest gas station is and Siri can use the map search feature to find it an then tell you about how long it will take you to get there. Apple also updated Chro… I mean Safari… the new browser looks a lot like Google’s, but there are a few technical differences (we wonder if Google patented the look and feel of Chrome…). While all of this is very cool for Apple fans and potential buyers the thing we found the most unusual was the massive amount of statistics that were thrown out. Steve Jobs would use numbers when he needed to, but was not one to throw around statistics and to the best of our recollection never talked money on stage during an event. With this year’s WWDC we saw Tim Cook put up the image of a big check stating that Apple had paid out 5 Billion dollars to developers since the App store opened. This was very strange and while it did elicit applause seemed very out of character for Apple. In fact the whole event seemed out of character. 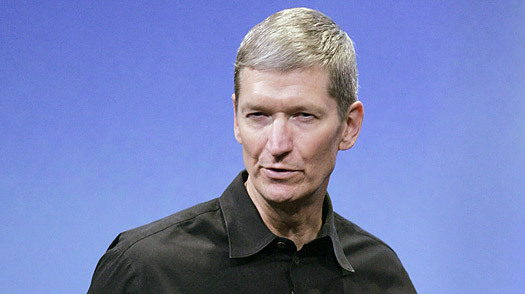 Some of this is to be expected as Tim Cook will undoubtedly do things differently, but it was more than that. We have referred to Apple press events as having the same type of electricity as a rock concert. That seemed to be missing this time; the air was more like a sales event and not did not (to our eyes) have the same intensity that we have seen before. I can vividly remember Steve Jobs getting a standing ovation for announcing Copy and Paste on the iPhone after it had been on every other phone for years. I think those days are over. The simple fact is, Apple will continue to release products that meet what their customers expect and will attract new buyers, but I would not expect them to have the same momentum as we have seen before. Tim Cook is a business man and a good one, but as time move one he is going to bring that side of himself to Apple more and more. We have a feeling that this could push some people away from Apple as they lose the connection they had and see Apple as a corporation for the first time (or at least the first time they will admit it). We are looking forward to seeing what iOS6 will bring on both the iPhone 4S and iPad 2 we have here. We will be sure to let you know how both of them work out after the upgrades.